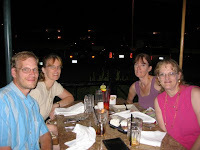 My brother, sisters and I at the Cheesecake Factory for my birthday in July 2006. I have set a goal in my life over the past several years to work hard to stay connected to the important people in my life. And a couple of years ago my one and only brother suggested that we take my younger sister out for dinner on her birthday. My older sister and I agreed that it would be a good idea. We did a night out at the Melting Pot on the Country Club Plaza in Kansas City. We were there for hours enjoying the fondue and the chance to get together, just the four of us. Needless to say, we had a lot of catching up to do, we remembered how much we enjoy each others company, and I suggested that we repeat this for each of our birthdays. So we did. Although it is difficult sometimes to set a date where we all four can get away, we do, and I think we are closer now than we have been for years. Last night we got a late start, but still managed to get out in the frigid January night to continue the tradition. My older sister's birthday was in late December, but this was really the first weekend that we were all four free and healthy. My sisters and I usually meet at my mom's house and then we all go together to pick up my brother. Last night was no different. My brother lives close to the Legends in Kansas City and we ate at a new restaurant there called Grandma's Chicken Ranch. They have good food and serve it family style. We had tried to go to the Irish Pub that had been in that building previously. The second time we actually drove there, and it was closed down. We ended up doing Italian food that night instead. Last night my older sister and I both had the grilled chicken, my brother had the chicken fried chicken and my younger sister had some kind of a cheeseburger. They served a bowl of salad, and a basket of biscuits and cinnamon rolls as the first course, and then the main course was served along with a big bowl each of green beans, mashed potatoes and gravy. Not bad. Soon into the meal we discovered that they would have karaoke set up that night and the stage area was very near our table. We left just as it was starting up. Good timing in our minds. The next sib birthday will be mine in July. A long time to wait, but we will get together again. Maybe not just the four of us before then, but we have many more kid and family birthdays and holidays to get together in the mean time.